WALLOPS ISLAND, Va. – At 4:46 pm EDT (2046 GMT) today (April 17), Northrop Grumman's Antares rocket will ignite, launching a robotic Cygnus cargo vessel packed with 7,600 lbs. (3,447 kilograms) of hardware, crew supplies and scientific experiments toward the International Space Station (ISS). The mission, known as NG-11, will be the 11th and final flight of NASA's first Commercial Resupply Services program (CRS- 1). The rocket will launch from Pad-0A at the Mid-Atlantic Regional Spaceport at NASA's Wallops Flight Facility in Virginia. Currently, the weather forecast is promising, and conditions are favorable for a successful launch. There are several reasons for the attendance surge, Voss said. 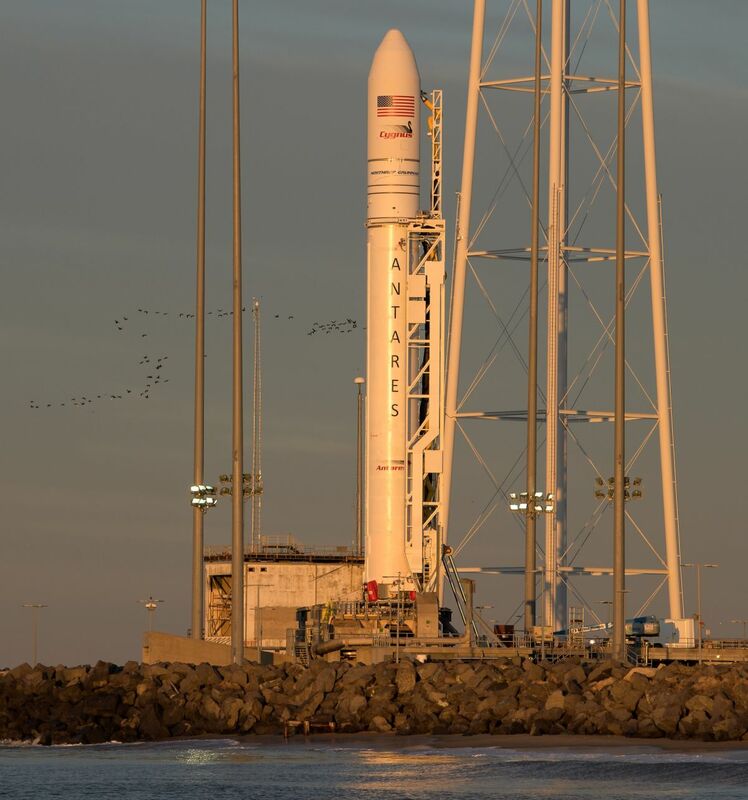 One is the accessible late-afternoon timeframe, a departure from most Wallops launches, which tend to occur very early in the morning. In addition, some students in the region are on spring break, meaning they and their families are more free to travel. And other students have made the trip because they're involved in scientific investigations headed for the ISS aboard the Cygnus. But do not worry: you will not have to brave the crowds to watch NG-11 lift off today. You can watch the launch live here at Space.com courtesy of NASA TV, or directly at NASA Live . The launch webcast will begin at 4:15 p.m. EDT (2015 GMT). Additionally, Space.com will be webcasting the launch live on Facebook. Exactly 21 years after NASA launched the space shuttle Columbia on the STS-90 mission, this mission will launch mice – the first rodents to ever fly in a Cygnus spacecraft – a host of tiny, helpful robots , and more. Indeed, NG-11's cargo is more than 50% scientific gear by weight. The haul includes new investigations and equipment to support ongoing investigations onboard the space station. "The Cygnus launch tomorrow is really important to us here in the science community," Voss said. Since science cargo can be loaded into the spacecraft up to 24 hours before launch – compared to the typical four days – scientists are able to launch more sensitive biological and physical science experiments, he added. The launch is also a testament to the continued partnership between international space agencies, NASA officials said. "We're doing research with all five partner agencies, so not only NASA, it's the Japan Aerospace Exploration Agency, the Canadian Space Agency, the European Space Agency and the Russian space agency, "Joel Montalbano, the deputy manager for the International Space Station Program, said in the news conference. "We work together, we combine what we learn in orbit, and we bring that back to Earth," he added. Follow Chelsea Gohd on Twitter @chelsea_gohd . Follow us on Twitter @Spacedotcom or Facebook .